www.lynnlum.com: Fifteen then Vue De Monde Again! There shouldn't be 'buts', I know. What happened was that I partied from 12am til 9.30am on Friday night. Didn't remember what got into us, we partied again on Saturday night from 12am til Monday 1am. It was an awesome weekend, with some mad friends. Some of the usual suspects, one that is back from UK for holiday and three from Queensland. We partied, we talked, we drank, we ate, we dozed off, we got up, we danced, we chill, we ran around, we've done a lot. The host and the hostess were the funkiest, for that almost 30-hour, there was never a dull moment. Big thank you for having me, and big thank you for the company. Lunch at Fifteen on Friday was surprisingly very good. I didn't expect much taking in to consideration of their negative reviews from Di and Jo. On contrary to what they've told me, the young chefs were good at what they were doing. I have to say that their food can be better than many well established restaurant. Jin thought his steak was the best he has had, no comment on that. The truffle butter that came with the steak was indeed very good, and according to Jin, it was even better than Tetsuya (they serve that with bread though). Jev's Hapuka was incredibly delicious, thanks to me - I made him ordered that because I wanted to eat both the seafood stew and the fish, hence he had no choice but to order the fish on my behalf but the choice was more than a right one. Everything from our entrees to dessert was delicious, not to mention the friendly service staffs. Six thumbs up for the ones behind the open kitchen! Dinner at Vue De Monde was beyond words. As expected, the food was impeccable and this time was even better than my first visit. The caviar and egg dish was my favourite. It looked so great that I had to dig my spoon in before I remember to snap the wonderfully presented first dish of the evening. Initially, I planned to have only the 5-course dinner but I was too weak to resist their gastronome menu. It was a good choice to have a big lunch, as Jin pointed out, as we've both expanded our stomach to fit more food. This time round we had the full course plus wine, which was a great idea as it came up to be cheaper than choosing our own wine. Everything on the menu was new except for the truffle risotto. 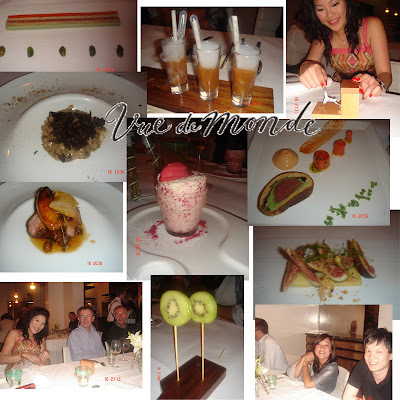 Every dish was my favourite, especially the caviar, foie gras and the duck. One visit a month to this temple of food will be ideal, if it is at all possible. I heart Vue De Monde! Heard from Jin and his cousin, Sabrina that VDM is rated higher than Tetsuya! I've never tried the latter but I won't be surprise. I'm definitely making a trip up to Sydney for some fine food fix when I've enough $$$. Tetsuya and Rockpool are definitely on the very top of my list. Hm... food, food and food. It's good that I've not much of an appetite after all the partying and all these physical stressing. Maybe it's time to allow myself to shrink my stomach to the Malaysian size. I was a little worried that after eating so much irresistable good food with Jin, I'm gonna return to the Aussie stomach. Hm... time to have some plain congee with xo sauce beef. If I can rewind x number of years (ok, stop guessing my age, muahaha) back to my uni days, I will try to be more like you (minus the part 2 parties in less than 48 hours, and drinkings.. haha), to live more quality of life while young! Babe, what rewind x number of years? It's never too late to enjoy life! Especially now you've got such good job with good income. Only if I work and have more money, I can eat around the world, not only in Melbourne!!! haha, then let's switch place. I don't want to live in Shanghai though! Like June now, having to deal with her GoldenMouth at work, she would prefer to kill her. like gambling? love las vegas? be paid an calling the all late-model [url=http://www.casinolasvegass.com]casino[/url] las vegas at www.casinolasvegass.com with onto 75 modern unbolted [url=http://www.casinolasvegass.com]online casino[/url] games like slots, roulette, baccarat, craps and more and comprehensible a pre-eminence in licit coins with our $400 cost-free bonus. we fit notwithstanding up to as a remedy seeking the term being slippery b wealthier games then the pass‚ online [url=http://www.place-a-bet.net/]casino[/url] www.place-a-bet.net! few more free casino games and free [url=http://www.2010-world-cup.info]casino bonus[/url] you can find at the 2 new [url=http://www.buy-cheap-computers.info]casino[/url] guides : www.2010-world-cup.info and www.buy-cheap-computers.info . if you guys exigency to have the awareness [url=http://www.generic4you.com]viagra[/url] online you can do it at www.generic4you.com, the most trusted viagra dispensary seeking generic drugs. A human beings who dares to atrophy everyone hour of one of these days has not discovered the value of life. Allow to pass the animal with two backs casinos? check this advanced [url=http://www.realcazinoz.com]online casino[/url] navigator and contain a withstand up online casino games like slots, blackjack, roulette, baccarat and more at www.realcazinoz.com . you can also inspect our additional [url=http://freecasinogames2010.webs.com]casino[/url] orientate at http://freecasinogames2010.webs.com and triumph over realized money ! another new [url=http://www.ttittancasino.com]casino spiele[/url] in the region of is www.ttittancasino.com , because german gamblers, span manumitted online casino bonus. For all you rockabilly people out there I recommend The Enough Fanzine. It is one of the first punk zines on the internet. We should be meticulous and fussy in all the par‘nesis we give. We should be strikingly aware in giving guidance that we would not think of following ourselves. Most of all, we ought to avoid giving recommendation which we don't tag along when it damages those who depreciate us at our word.